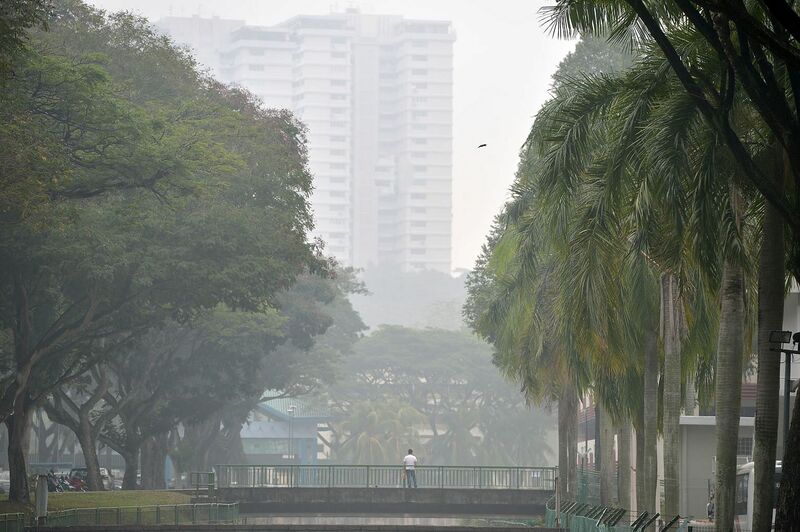 Dry throat and itchy eyes - Singapore residents have all become reluctantly familiar with the effects of haze on our bodies. Even pets are suffering from haze-related illnesses, as reported recently. value in a forest would be questionable), and they can't escape behind closed windows. Are they dying in the dozens or doing just fine? Essentially, the scientific answer is: We don't know. Little research has been conducted on the topic. As an ecologist, I've spoken to several zoologists and botanists on this topic recently. Based on what we know about animals and their needs, and what we know about the haze, these experts shared their observations and opinions on the potential impact of haze. The haze has two main effects on the environment that affect animals: smoke and sunshine. First, smoke. This is the most obvious effect of haze. Animals need to breathe, and the presence of smoke and pollutants in the air could cause breathing difficulties for them just like it does for humans. Birds, for example, consistently take in oxygen to support their active lifestyles of flying, foraging for food, looking for a mate and singing. With less available oxygen in the smoky air to fuel them, birds might be expected to be less active. And that seems to be the case - captive birds are reported to be quieter and less active on hazy days, and researchers have noticed bird activity to be lower this month in an ongoing rooftop garden study. This means less time spent doing important things like looking for a mate. Frogs, too, are less active during the haze, not unlike their response during dry periods, Dr David Bickford, an expert on frogs, says. Their permeable skins and need for moisture might mean they are sensitive to the hotter and drier air the haze brings. Frogs may be quieter during hazy periods, with the males not calling as passionately. The effects of smoke on mammals are probably easier to understand as they are most like us. For example, monkeys have eyes like ours and lungs like ours (albeit smaller and therefore less able to handle pollutants), and probably experience a dry throat and itchy eyes like we do. In the immediate term, young and elderly monkeys might suffer the most, but the rest of the population is likely to be fine, if slightly less rambunctious than usual. If we are lucky, the haze-filtered sun casts an eerie orange light on the country; if we are unlucky, the sun is blocked out entirely, and this seems to bother some animals. Two butterfly experts, Mr Anuj Jain and Mr Simon Chan, told me they recall seeing fewer butterflies during the 2013 haze event, and think this might have been related to the lack of sunshine. Butterflies are more active on sunny days, frenetically feeding and frolicking with potential suitors. When butterflies are less active, they might not reproduce - and given that the average lifespan of an adult butterfly is three weeks, (well within the normal timeframe of a haze event), the butterflies might die without reproducing. But decreased activity in one or two generations is not enough to impact the populations, Mr Jain says, as insect numbers naturally fluctuate over time. Butterflies have a neat survival trick of choosing to spend more time in egg or pupae stages until they sense better environmental conditions for life. Butterflies and other wildlife in this region have probably not evolved to deal with fire and haze, given that it is a recent human-induced phenomenon. Short-term disruptions may not affect entire species or ecosystems, but long-term effects are unknown. Apart from animals, plants also depend on sunshine. They need sunshine to photosynthesise, and this gives them food to grow and to produce leaves and fruit. Less sunshine is available to plants when dust settles on their leaves and when the sun is blocked out by the haze. Extensive research in Indonesia has been conducted on plant response to haze since the 1990s - their findings show that plants grow slower, lose leaves faster and photosynthesise less due to reduced radiation and elevated pollution levels. This means plants will probably produce fewer fruits when it's hazy. This is why palm oil production is expected to be lower this year as less palm fruit is expected. But there is yet another consequence of haze that could damage the health of plants, wildlife and entire ecosystems: the effect of acidity and nutrients. If the haze is a result of forest fires, it follows that haze is composed of carbon-based particles. When these particles dissolve in rainwater, it could result in acidification of the rainwater, which in turn would increase the acidity of any environment that the rainwater lands in. Such acidic rain could dissolve protective leaf cuticles, increase soil acidity leading to root death, and affect vital soil cycles. All of this would weaken plants, leaving them vulnerable to pathogen attack, says botanist Lahiru Wijedasa. "Increasing acidity just needs to affect one plant process in a magnitude enough that will affect everything else - and the same applies to all ecosystem processes," Mr Wijedasa told me. Ecosystem-level changes could be more dangerous than changes to individual species as such changes could impact entire ecosystems and the plants and animals that make up that ecosystem. Increasing acidity could also directly affect aquatic animals such as tiny insects, crabs and frogs. Such species can be more sensitive to pollutants, and may also react to any increase in nutrient levels in the streams. While nutrients are desirable, excess nutrients can have devastating effects on ecosystems, particularly freshwater systems. Researchers found nutrient levels of nitrogen and phosphorus were up to eight times higher in the coastal waters of Singapore during previous haze events - but we don't know if similar effects occur in our forest streams too. Frog eggs and tadpole development could be compromised, especially in our less hardy forest species, which are more likely to undergo high physiological stress, says Ms Mary-Ruth Low, amphibian and reptile researcher. But the impact of haze may not be direct. A real risk is that the haze depresses the immune system of an animal and leaves it open to attack from bacteria, viruses and other baddies - this is why we often get colds during a haze event. A disease a healthy animal can fight off under normal conditions might become the straw that breaks the camel's back in the haze. In the absence of rigorous studies, all we can offer as wildlife and ecology experts are our observations and considered opinions. Wildlife - and humans - might be able to handle short bouts of haze, but of concern is prolonged exposure, repeated exposure, high extremes and the impact over the long term. How to mitigate the impact of the haze on wildlife is similar to that for humans - reduce the haze through better agricultural practices - for example, sustainable oil palm practices which do not burn forests or peat forests for planting crops. What's good for Homo sapiens in this case is good for wildlife too. •The writer is principal ecologist at Ecology Matters, an environmental consultancy providing ecological advice and biodiversity studies for environmental impact assessments.